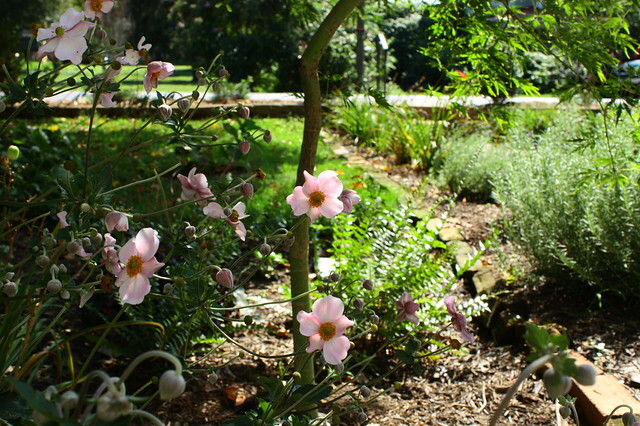 Japanese anemones in the front yard. It all began on an autumn afternoon—and who, after all these centuries, can describe the fineness of an autumn day? One might pretend never to have seen one before, or, to more purpose, that there would never be another like it. The clear and searching sweep of sun on the lawns was like a climax of the year’s lights. Leaves were burning somewhere and the smoke smelled, for all its ammoniac acidity, of beginnings. The boundless blue air was stretched over the zenith like the skin of a drum. It is worth noting that I have finally read John Cheever and have since concluded that he is perfection. After what felt like a month of rain, we are so grateful to have the sun return to us. The dogs are decidedly less filthy now, and for that, we offer up daily expressions of thanksgiving. One of my all-time favorite nonprofits in town, New City Arts, is trying to raise $37,000 in 37 days to support its studio and gallery space, which in turn will support local artists and our arts-loving community. If you have a few bucks to spare, would you consider helping us out? For a $40 donation, Guion will write you a personalized poem, which is bound to be a special, strange, and wonderful thing. Pyrrha needs to lose five pounds, according to the vet, and I agree and simultaneously feel like a terrible mother. The vets are gentle but firm when breaking this news to pet owners, especially American ones, because we seem to prefer that all of our pets are grossly obese. I had always prided myself on keeping the dogs trim, but I slipped up this time, and I am wracked with guilt and shame. I suppose it isn’t surprising, given that I have not altered Pyrrha’s food intake much as she has aged, despite the fact that she is (a) an inveterate beggar and (b) incurably lazy and (c) almost five years old and thus acquiring that adult metabolism. She’s going on a diet and she’s very, very unhappy about it. She also has a yucky ear infection right now that we are treating, and so, all in all, it hasn’t been a great start to the month for P.
I’m not sure what’s wrong with me, but it must be something horrible because I haven’t been much in the mood for reading lately. I read 20 pages of Purity, Jonathan Franzen’s new novel, and have since felt unmotivated to pick it back up for weeks now, and I am moving very slowly through Ferrante’s final novel in the series, The Story of the Lost Child, but that could also be the interior desire for the series to never end. I am not sure. I am restless and suspicious. I highly recommend Nadia Bolz-Weber’s Accidental Saints: Meeting God in All The Wrong People. Great theology. She is the David Sedaris of Theology. I got to see her speak at a conference in New York in April, and she was wonderful. I really enjoyed her first book, and I’m looking forward to reading her second. Glad to hear that you enjoyed it!